No matter if you follow the official account of the Polish Football Association or what Legia claim themselves (they insist they have won an extra Championship title which the PFA officially awarded to Lech Poznań in 1993), the “Legionnaires” are the most successful club in Poland. The number of domestic trophies they have won (Championship and Cup titles combined) makes them second to none in Poland. The SA initials stands for Spółka Akcyjna, which in English can be translated to "stock-offering company" (the club is often referred to as Legia Warszawa FC in English-language context), also the initials CWKS are associated with the club. Polish Army Stadium in 2016, before a Legia vs Ruch Chorzów game. Given that the first players who wore the jersey of the team were soldiers fighting with the Polish Legions in World War I, it comes as no surprise that the founders chose Drużyna Sportowa Legia, Sport Team Legia, as their name. Four decades later, in the mid fifties, it was time for Legia Warszawa SA to transform themselves from a decent team at local (Warsaw) level, to a top one at national level. The first truly great year for them was 1955. The end of that season found them crowned both champions and Cup winners, a remarkable success that they repeated next season. The sixties brought more trophies to Legia club. Cup wins in 1964 and 1966 were followed by two more back-to-back Championship titles in 1969 and 1970. Furthermore, the first months of the seventies brought the Warsaw club international fame as well, reaching the semifinals of the European Cup, the predecessor of today's UEFA Champions League. The last two Championship titles were the only ones that Lucjan Brychczy and Kazimierz Deyna won playing together. The former, a formidable striker, first in both lists of leading goalscorers and matches played, was soon to retire, having served Legia for 18 years, and having been part of all teams that won the first eight major trophies for the club in the fifties and the sixties. As for legendary attacking midfielder Deyna, he stayed at Legia until 1978, winning another Cup title in 1973. Sadly, he died in a car crash in San Diego, California, in 1989, aged just 41. A monument honoring him and his services both to the club and Poland's national team, lies these days outside Legia's stadium. It took Legia almost a quarter of a century to celebrate another Championship title, but the early and late eighties were rich in Cup successes. Four triumphs in 1980, 1981, 1989, and 1990, had another presence in a European semifinal (Cup Winners' Cup, 1991) as a high-profile added bonus to the club's prestige. When they finally won their fifth Championship, in 1994, they did it in true Legia style, adding a back-to-back title next season, just like they had done in the fifties and the sixties. Actually, they achieved the double both seasons, winning in two more Cup Finals. 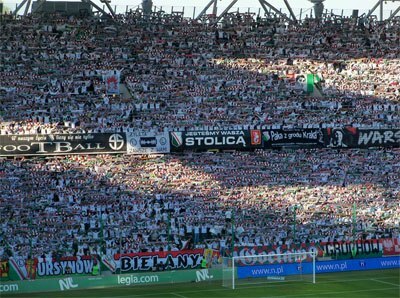 Legia's famous “Żyleta”, Polish Army Stadium's northern stand (2011). 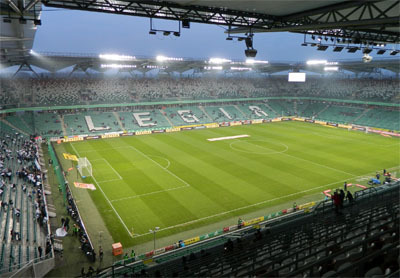 In the first years of the 21st century, Legia Warszawa have established themselves as a dominant force in Polish football, challenged in titles only by Wisła Kraków. Their latest double in the 2015-16 season, gave their impressive (both in size and passion) fan base a perfect extra reason to celebrate their historic club's 100th anniversary. Interestingly, Legia are one of those few clubs that their official logo is different to the one that can be seen on their jerseys. The green/red/white/black logo seen here, has not been included in a jersey design since 2002, with a simple large black “L” in a white/black circle being used instead.